Sony Japan Studio released a new video detailing some of the absolutely huge bosses that you and little Astro will take on. The developers behind Astro Bot Rescue Mission discuss creating some of the bosses you will fight. The game is landing on PS VR on October 2. In the video Nicolas Doucet, Creative Director, Tuyen Ngo, Gameplay Programmer, Sebastian Brueckner, Art Director, and Jamie Smith, Lead Animator, discuss the process behind creating bosses and the unique perspective afforded by virtual reality. In a blog post Nicolas Doucet says that "These bosses are huge and create an amazing sense of scale in VR. Defeating them will not be a small affair though and your platforming and gadget skills will be put at use," and "Every one of them features a unique finale with a special mention for the final boss. And you’ll have to play to find out!" 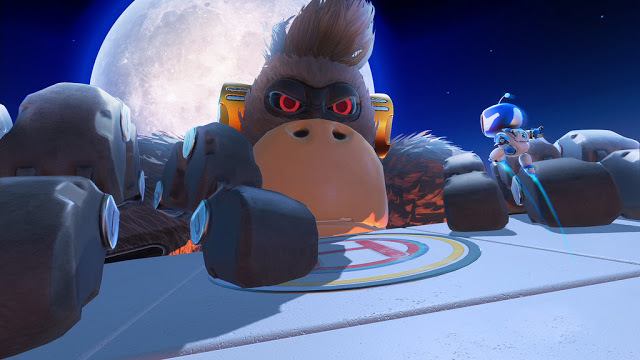 Also adds that "As a VR player, you also exist in this world in first person and larger enemies will not hesitate to attack you, occasionally causing damage to your visor or blocking the view, exposing Astro to new dangers. Using your body, you will need to dodge incoming attacks by leaning, distribute a few headbutts, and use your deadly DualShock 4 gadgets to put an end to them. ASTRO BOT Rescue Mission releases next week on October 2.